The Department of Transportation (DOT) requires employers to train supervisors to meet compliance rules. 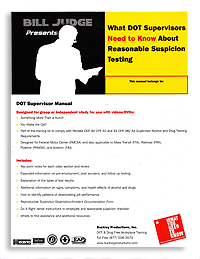 Our DOT supervisor training kit along with your policy will help you meet these requirements. 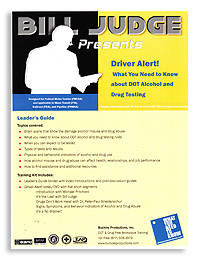 The DOT also requires the employer to educate their covered employees in trucking, mass transit, railroad, pipeline, aviation, and maritime about drug and alcohol rule violations, types of drug tests, occasions of testing, signs and symptoms, and where to get help. The Driver Alert! Kit can be used for all of these DOT modalities. For more information and to view sample clips click on the symbols below. For each kit we have included a sample video for you to view. If you would like to review a kit at your location please contact us.